Le Mans is found about 80 kilometres north of Tours, and south of Alencon. 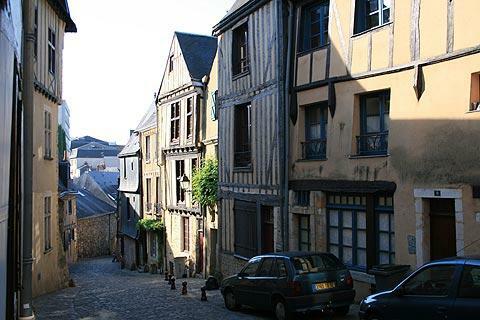 Known as the Cité Plantagenet, it is here in Le Mans that in 1129 Geoffrey Plantagenet married Matilda, daughter of Henry I of England and gave birth to Henry II. To many of course, Le Mans means nothing apart from a 24 hour racing spectacle once a year (if you are not interested in cars and car racing, it is best to avoid visiting Le Mans in the middle of June) however Le Mans also has a fantastic old town and is well worth a visit. 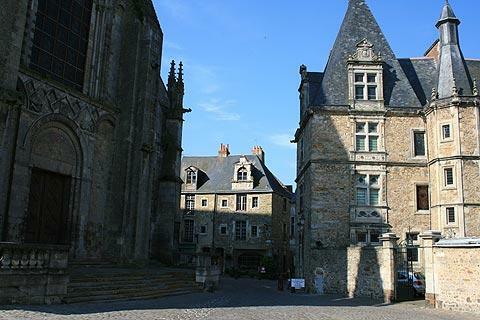 Unlike the medieval quarters of most towns and cities in France, that of Le Mans is completely separate to the modern day town. 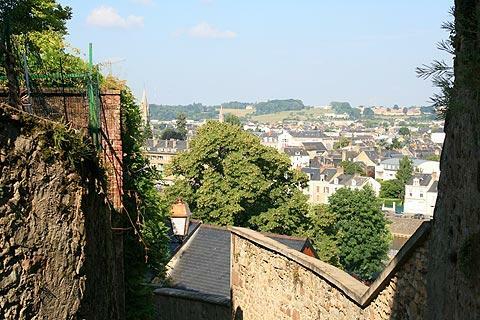 It lies high above the town and is almost spookily quiet after the noise of the thriving city below. The magnificent St Julien Cathedral can be seen from below and can be reached by walking up the steps from the car park in the Place des Jacobins. 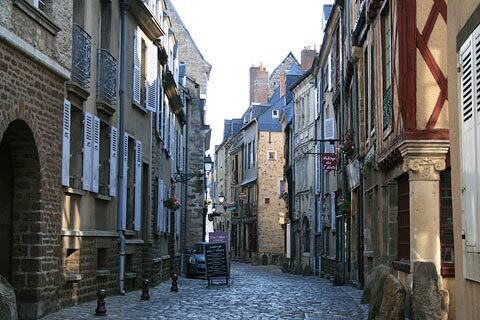 The old town has lovely narrow streets, stone houses, many with intricate details, colombage (timbered buildings) and the lovely slate rooves common to this area of France. 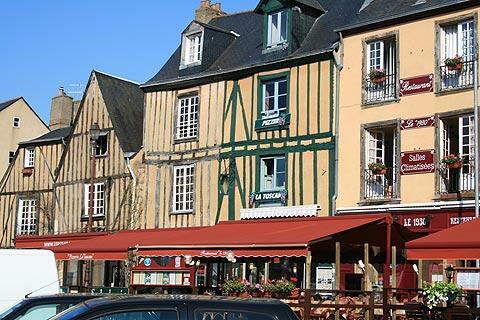 There are numerous half-timbered medieval houses in Le Mans dating from the 14th to 16th centuries: the best known is the 'Maison du Pilier rouge', from the 16th century and on Grand Rue, with its easily recognisable red-painted wooden structure. Interestingly you can tell which houses are the oldest by the design. The houses that have upper floors that protrude forwards of the lower stories are the oldest (typically 15th century), with the extended upper floors serving to increase floor space upstairs, and to protect the entrance from rain. The best place to see this is the group of houses along Rue de la Rene-Berengere, where the Maison du Drapier and Maison de la Reine-Berengere stand either side of the slightly more recent Maison de l'Ave-Maria. 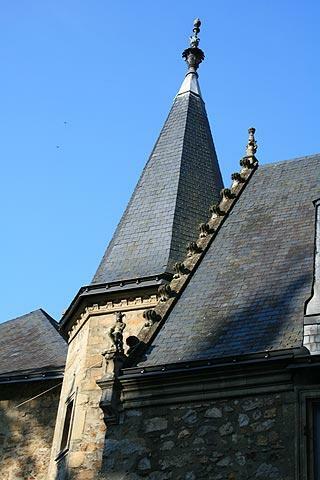 The Le Mans tourist information office is sited in the Maison du Pilier rouge. In recent years work has been carried out to restore the woodwork of the timbered houses to their original colours. As well as the red pillared house there are others with timbers painted in blue and green. 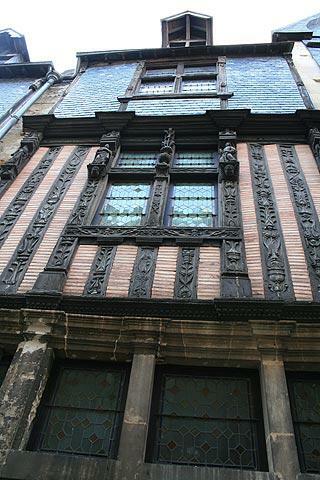 The presence of many timbered slats in the houses along with intricate stonework denotes a bourgeoise house, i.e. 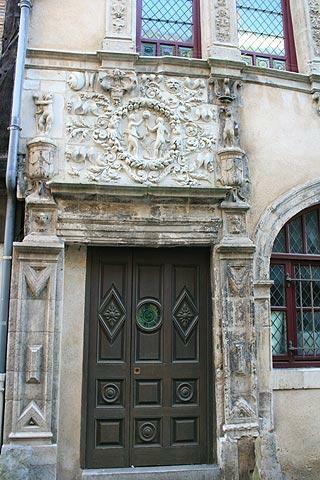 the home of one of the wealthier inhabitants of the medieval city. 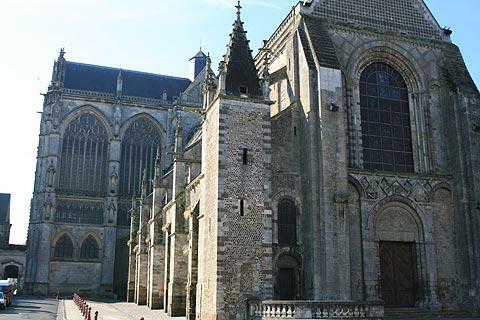 The highlight is the St Julien cathedral which was built between the 11th and 15th centuries. 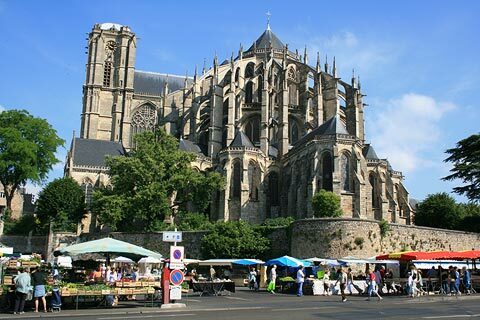 It is a mixture of styles because of the long time taken to build it and is one of the largest cathedrals in France. At the main entrance of the Le Mans cathedral you can see a stone menhir which was raised by the prehistoric people who lived here in 4000-5000 BC. The menhir which became a pagan symbol for fertility was saved from destruction by Saint-Julien who came to Le Mans in the 4th century. 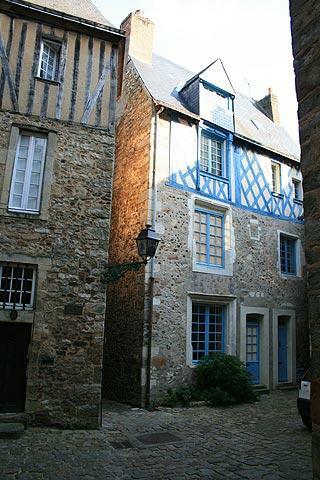 Opposite Le Mans cathedral on the Place du Cardinal Grente is the Bishop’s house, a lovely 16th century building and next to it the Pilgrim’s house, also 16th century. 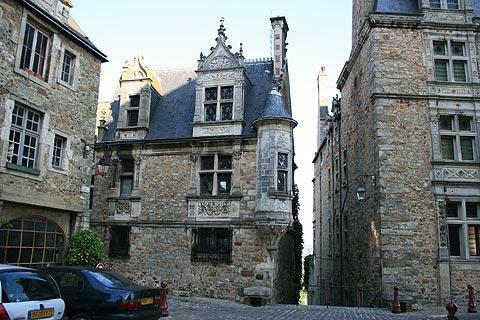 Within the old town you can visit the museum of Reine Berengere where you can see pictures and maps of the old Le Mans as well as popular art of the region. Much remains of the Roman wall around the old town which is one of the best preserved in Europe. Four of its original five towers still remain. At one of these a lovely little medieval style garden has been created and within it are some of the stone balls hurled against the town by the Count of Salisbury during his assault of 1425. The Royal Palace (now the Town hall) is an impressive ensemble of buildings in part dating back to the 11th-12th centuries, next to the little Isaac river. You can descend by steep stairways that pass through the roman walls to the river below and the Roman baths. Every night in July and August Le Mans features an incredible light show put on in the streets of the old town. Various facades of the Plantaganet City are lit up with scenes created by Skertzo. A free spectacle not to be missed. 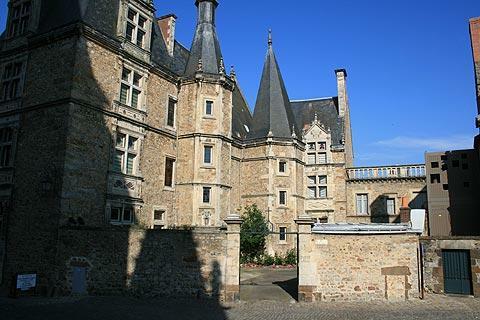 Down below in the modern town of Le Mans you can visit the Tessé museum which is in the Bishop’s Palace on the edge of Tessé park. This museum contains the city’s fine art collection and has added a large space dedicated to ancient Egypt and includes two full scale models of Egyptian tombs. For garden lovers as well as the Tessé park there is also, close by, a ten acre botanical garden designed by André Alphand. 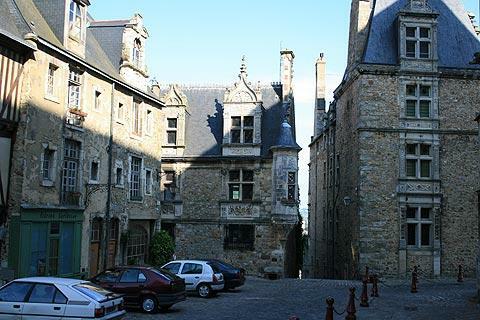 Film enthusiasts will recognise parts of the old city as many films include scenes of Le Mans. The most famous is ’Cyrano de Bergerac’ with Gerard Depardieu, and others include ‘Man in the Iron Mask’ and ’The 3 Musketeers‘. And of course there is the ’Le Mans race‘, more correctly known as the "24 Hours of Le Mans sports car race" or ‘The Le Mans 24 Hours‘, which takes place on public roads (closed for the day!) and has been held since 1923. This takes place in mid-June each year. There is a driver's parade on the eve of the race allowing you to meet the competitors and their cars. Enthusiasts can visit the museum of the 24 Heures du Mans and discover the history of the course and the heros that have made it legendary, 120 mythical cars, a unique collection of miniatures and exclusive items from the history of the automobile. It is also possible to visit the circuit: accompanied by a guide who tells anecdotes about the race you will discover what it is like behind the scenes, see the Press Room and the podium where you will feel the thrill of a triumph at Le Mans. Both self-guided and guided visits are available. For vintage car fans there is the ‘Le Mans Classic’ in July every second year. This is one of the leading vintage car events worldwide and includes 5000 vintage club cars. Be sure to ask for the 'Plantagenet City route map' in the Le Mans Tourist Office, which shows very well all the highlights of the old city, and how to find them by following four suggested routes through the city. For a reduced price (approx.12 euros for 24 hours or 19 euros for 48 hours) you can buy a city pass that allows entry to: Abbey l'Epau; Automobile Museum; Tessé Museum; Reine-Bérengère Museum; the Green Museum; the maison de l'Eau, the Donjon de Ballon, and includes a guided tour of the town and a boat trip - worthwhile if you plan on visiting a few of these Le Mans attractions. 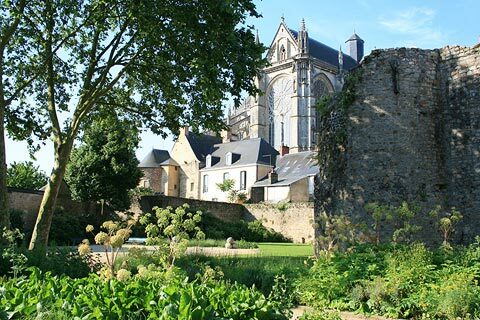 Among the places of interest to visit near Le Mans, Sillé-le-Guillame and Beaumont-sur-Sarthe are to the north-west of the town, and Parcé-sur-Sarthe is a small 'city of character' to the south-west of here.